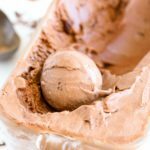 Do you have a favorite healthy recipe masquerading as something indulgent? 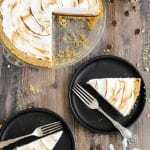 I have plenty of indulgent treats masquerading as healthy but very few that taste decadent but won’t wreck your diet. These Blueberry Banana Bran Muffins are just that: crazy delicious but packed with fruit and fiber. I am really into faux-indulgent these days. 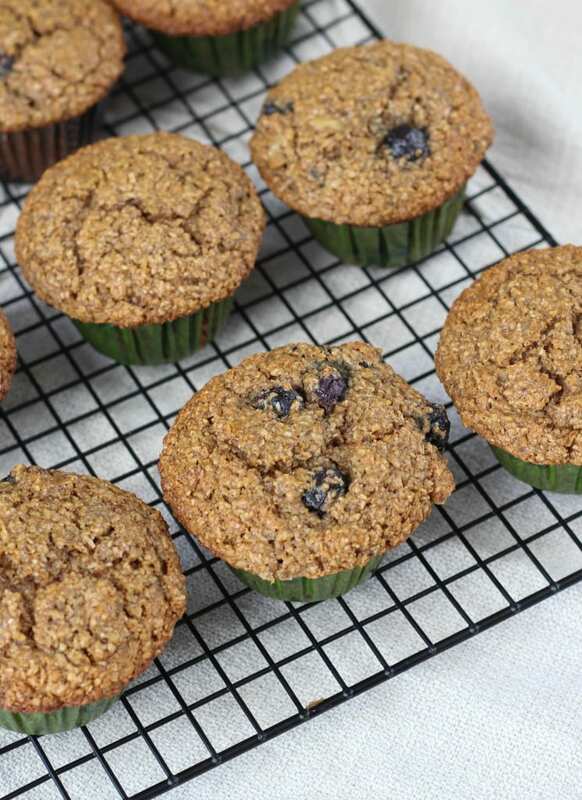 These muffins are packed with healthy wheat bran, oat bran, whole wheat flour, flax seed meal, bananas, and blueberries! They are so moist they melt in your mouth. Every time I make them my fiancé asks, with a mouthful of crumbs, “Are these bad for us?” Because they are that good! I put them in the freezer to thaw as needed so that they last longer, but it’s hardly necessary because they stay moist for days in a plastic, zip top bag and they honestly don’t last that long. You know those muffins and breads that only get better the blacker and riper your bananas? This isn’t one of those recipes. I think it is best when the bananas have just started to spot brown and the skin is thin and they are fragrant but not pungent. You know what I mean! 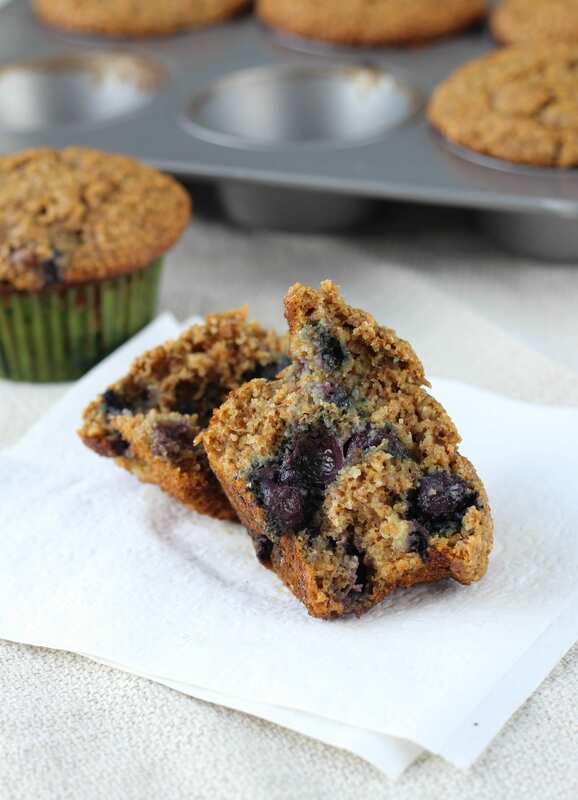 So grab that left over buttermilk and whip up a double batch of these Blueberry Banana Bran Muffins right now. After one bite you are going to wonder where these have been all your life, and why every other bran muffin now tastes dry and unsatisfying. 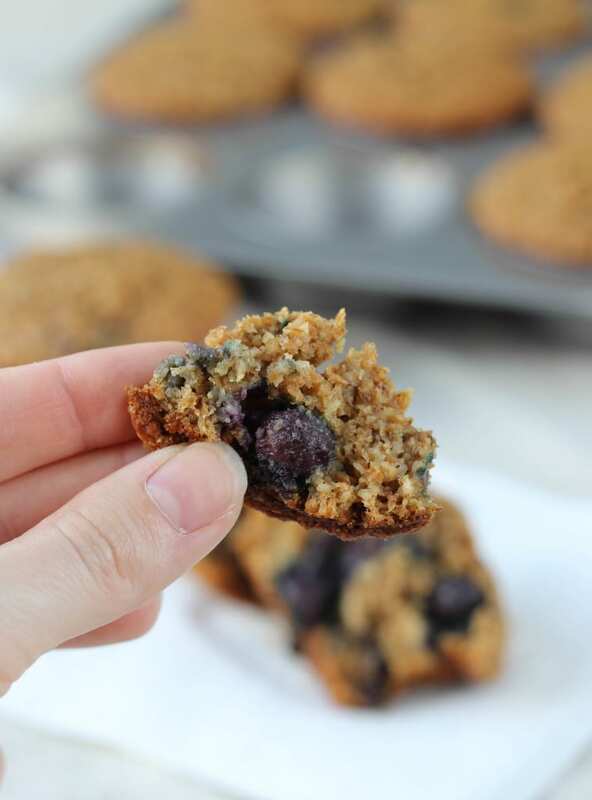 These Blueberry Banana Bran Muffins are so moist they melt in your mouth and are packed with healthy ingredients like wheat and oat bran and flax seed meal! Preheat the oven to 400° and either grease 12 muffin cups or line with liners. They are even more moist when you use muffin liners. Mix buttermilk and wheat bran and set aside to soak. In another medium bowl mix together all the remaining dry ingredients. In a large bowl add egg, sugar, oil, banana and vanilla and mix until well combined. Gently stir the dry mixture and buttermilk mixture into the egg mixture and mix until just combine and a few lumps remain. Fold in the blueberries being careful not to over mix. 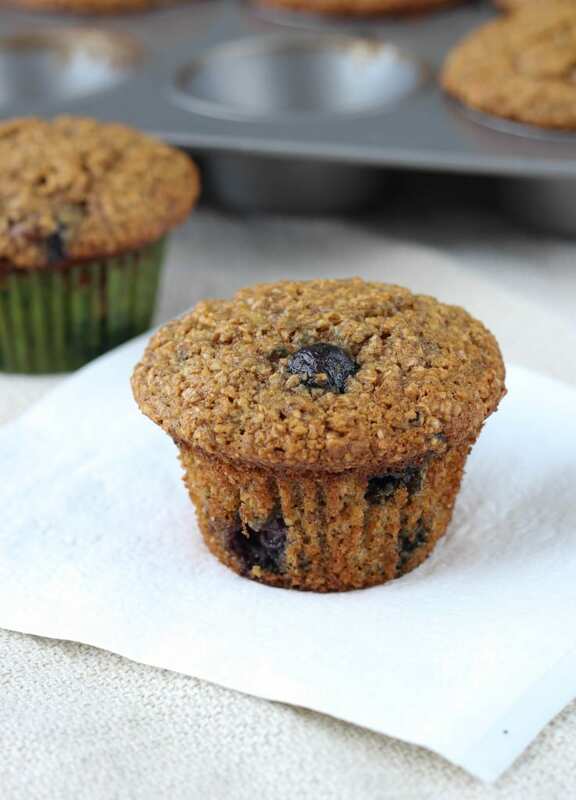 Pour into prepared muffin cups and bake for 20 minutes or until a toothpick comes out a few crumbs clinging to it. Cool 5 minutes in tins and then turn out onto rack to cool completely. Yummy! Trying these right away! MOB Wedding Fairy or not! Oh I think these are Wedding Fairy approved! I’ve been eating one with yogurt for breakfast! Sooo good! btw what is MOB? lol. I love the flavors of banana and blueberries combined. These look so yummy. I’d just love to bite into one of them with a glass of cold milk. These muffins look like they came straight from a bakery! Love treats that are yummy and healthy! Thank you! These are a must make! You’ll never want another type of bran muffin again. What a delicious and healthy breakfast treat! Love making muffins because my kids will hardly ever sit down and eat before they go to school. Muffins are the perfect on the go breakfast! They are definitely perfect for breakfast or a quick snack before the gym! Your kids will love them! Hello! I so want to try these today they look awesome, but I have no oat bran! Is there something I could replace it with? Also how do you think fresh cranberries would substitute for the blueberries!? Hi Ashley! 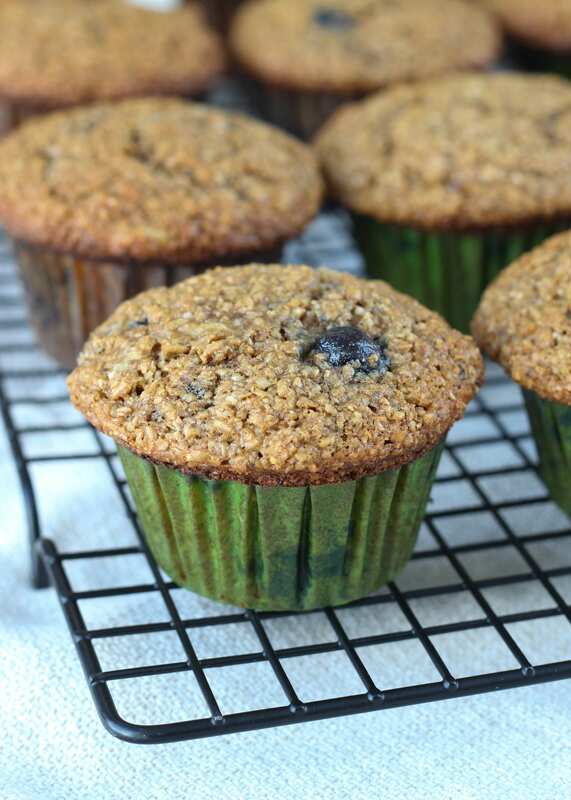 I have made them before using all wheat bran and they were just as delicious! The fresh blueberries do add a little moisture so I would add a little bit more banana if you have some. If not, I wouldn’t worry too much! Let me know how they turn out!! I’m so glad! Thanks for stopping back! I have no wheat bran can I just use more oat bran? You certainly can and I have done that in a pinch!! I can not wait to bake these up for my toddler and husband. I would like to make them into mini muffins. Would I need to alter the temperature and baking time? Hi Renee! What a great idea! You won’t need to alter the baking temperature but you will absolutely need to reduce the cook time. There are several different sizes that people call “mini”, so I’m not really sure how long to tell you. I would start checking after 5 minutes through the oven door and then open it after they have risen to check with a toothpick inserted into the center. The recipe when made with frozen blueberries does take slightly longer to bake than when made with fresh! Enjoy! Great recipe – blue berries and bananas provide the perfect texture and moisture – will make again! Thanks, Jennifer! I am so glad you enjoyed them! I just wanted to say thank you for the recipe! I’ve made these muffins many times now and they always turn out great. Now that berries are back in season, I make them weekly and they always all disappear. It’s so easy and soooo good and even good for you. 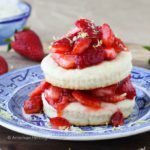 My husband is lactose intolerant so I use lactose-free milk (just 1 cup) instead of buttermilk and it still turns out great. Thank you so much, Emily for stopping back by to tell me! Aren’t they so easy and they come out perfectly every time! I have some blueberries in my fridge, which I bought on impulse, and now I know exactly what I should make with them. That is great to know they still work with lactose-free milk! Your comment made my day! These turned out so good! I used 2/3 coconut palm sugar instead of brown sugar and they were amazing! Thank you for the recipe! You are most welcome, Allison! Thank you for the comment! Happy baking! 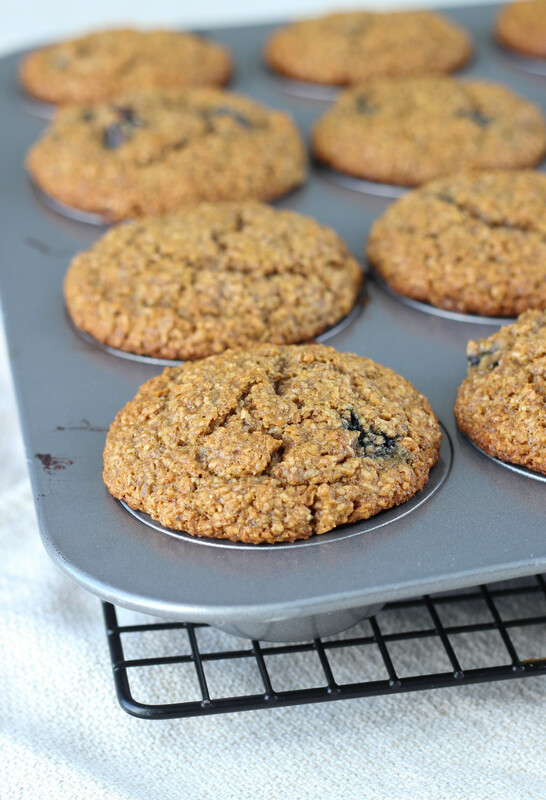 Wow, these really *are* the best bran muffins ever – just baked a batch and they are wonderful. I have to admit I was dubious when the bran soaked in the milk turned into a thick sludge but they came together perfectly and 20 mins at 200c (395f Ithink) gave me a batch of really excellent muffins – they’re so light and fluffy but moist at the same time and you can actually taste the bran. I only used 1/2 cup sugar as I find most American recipes have far too much sugar for my taste and I’m glad I did because they are just perfect, not sickly sweet but certainly not bitter. They really couldn’t be better – so thanks for the recipe, this will become my “go to” recipe for these muffins now. Thanks, Mike! You’ve reminded me that I need to make these again! They really are, aren’t they!?!? I wouldn’t dare lead you astray! Happy baking! I have been making bran muffins for over 50 years — from an absolute plethora of recipes, but none matches this. I cut the sugar by 50% and the oil by almost 30% and they were still scrumptious, moist, sweet — perfect. I don’t think i’ll Ever google the words “bran muffins” again. I even snuck in 1/4 c of the hideous hemp protein I bought for smoothies but can’t gag down, and it disappeared anonymously into these wonderful muffins. I hope you are enjoying married life after almost five years! We celebrate #46 this summer, still loving each other like crazy. 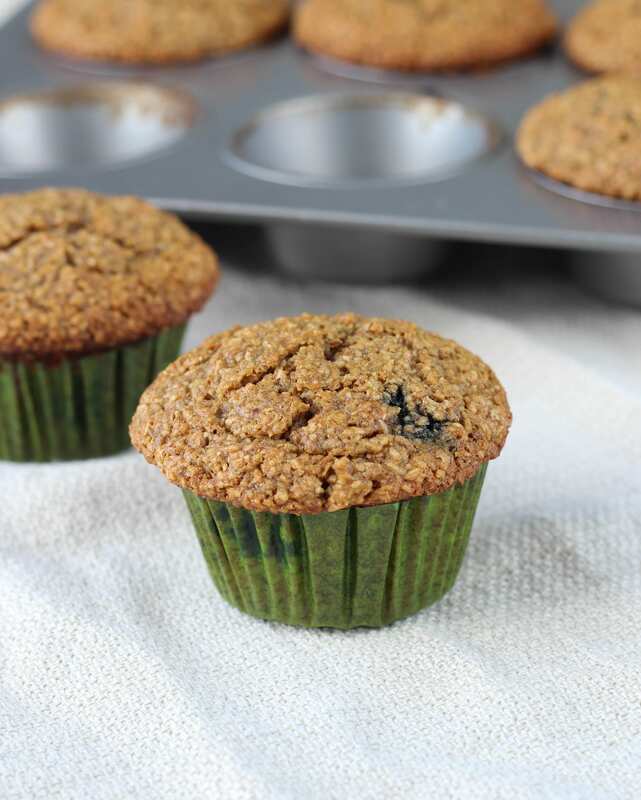 And bran muffin recipe that can hide hemp protein is a keeper in my book! lol! I am so glad you finally found your “go-to” recipe! Many blessings to you and your husband! 46 years is quite the triumph! Happy baking! 1 cup fresh or frozen blueberries – I used frozen blueberries and chopped up a banana into small pieces and added them also at the end with the blueberries.